More than 20,000 species of bees exist and new species are frequently discovered. Bees range from solitary, independent individuals to highly dependent members of complex social structures. (Phys.org)—A team of researchers with Royal Holloway University of London and the University of Reading, both in the U.K., has found via field study that one type of pesticide exposure led to impaired pollination services by bumblebees. In their paper published in the journal Nature, the team describes their study of the impact of the pesticide thiamethoxam on bumblebee pollination of apple trees, what their results showed and the types of pollination service disruptions they observed. Bees have been under scrutiny of late due to the discovery that their numbers are declining, partly due to colony collapse. While the cause of the decline has not been clearly identified, many scientists believe exposure to pesticides is partly to blame. To that end, several studies have been conducted to look at what happens to bees when they are exposed to non-lethal amounts of different pesticides. In this new effort, the researchers looked instead on the possible impact on pollination by bees exposed to one type of pesticide, instead of the impact on the bees themselves. The study involved assembling three groups of bumblebee colonies and exposing two of them to two different levels of the commonly used pesticide thiamethoxam—2.4PPB and 10PPB and then allowing them to pollinate segregated apple trees. The third group was used as a control. The researchers monitored the bees as they visited apple blossoms and took samples of pollen loads the bumblebees carried back with them –they also monitored the progress of the apples that grew on the tress pollinated only by the bumblebees used in the study. 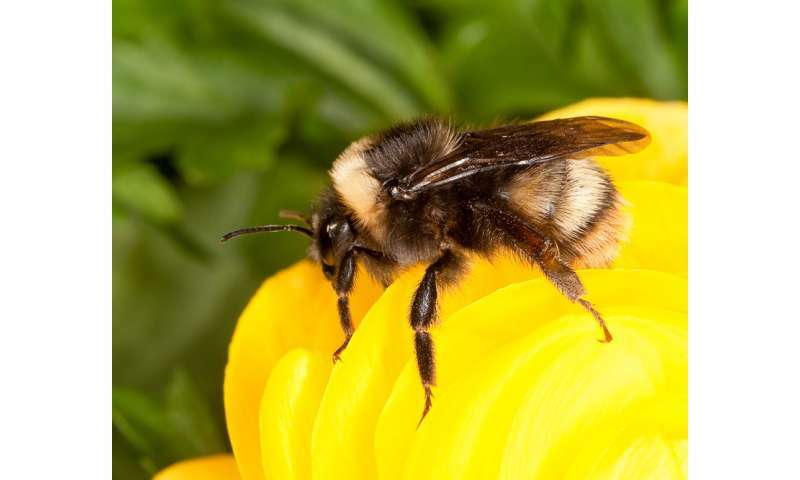 In looking at the data, the researchers found that in those bumblebee colonies exposed to the pesticide, there were lower visitation rates to apple trees and less pollen collected—also the apples that were pollinated by the bumblebees in the study produced fewer seeds. They report also that the colonies exposed to the higher levels of the pesticide showed the strongest impairment. The team also conducted restricted access studies and found that the impact was much more pronounced when the colony as a whole was pollinating trees, than when individual bumblebees were allowed to work in isolation. This makes it likely, the team concludes, that the impact of the pesticide is colony based, rather than individually bumblebee based. Recent concern over global pollinator declines has led to considerable research on the effects of pesticides on bees. Although pesticides are typically not encountered at lethal levels in the field, there is growing evidence indicating that exposure to field-realistic levels can have sublethal effects on bees, affecting their foraging behaviour, homing ability and reproductive success. Bees are essential for the pollination of a wide variety of crops and the majority of wild flowering plants, but until now research on pesticide effects has been limited to direct effects on bees themselves and not on the pollination services they provide. Here we show the first evidence to our knowledge that pesticide exposure can reduce the pollination services bumblebees deliver to apples, a crop of global economic importance. Bumblebee colonies exposed to a neonicotinoid pesticide provided lower visitation rates to apple trees and collected pollen less often. Most importantly, these pesticide-exposed colonies produced apples containing fewer seeds, demonstrating a reduced delivery of pollination services. Our results also indicate that reduced pollination service delivery is not due to pesticide-induced changes in individual bee behaviour, but most likely due to effects at the colony level. These findings show that pesticide exposure can impair the ability of bees to provide pollination services, with important implications for both the sustained delivery of stable crop yields and the functioning of natural ecosystems.